Arborvitae hedges create excellent privacy screens, windbreaks, and offer evergreen color in the winter landscape. Dr. William Chaney notes that sparrows, warblers and kinglets find shelter in the thick, dense growth. Thuja occidentalis, also known as white cedar or eastern arborvitae, has reddish bark and aromatic fan-shaped leaves with 1/2-inch cones. Arborists have developed modern cultivars with landscape qualities far superior to the towering 300-year-old native trees found in eastern forests. Plan your location. Arborvitae grow best in full sunlight but will tolerate some shade. Adequate soil moisture or irrigation is a must; arborvitae will suffer in a hot, dry location. Locate the hedge completely on your property when mature, allowing space for airflow between fences or buildings. Wise gardeners know the homeowner is responsible for maintaining both sides of the hedge and allow a foot or more of access on the backside. Choose a variety of arborvitae recommended for your gardening zone. Available cultivars resist snow breakage, retain green color in the winter, grow shorter or taller heights, and narrower or fuller widths. Ask your local garden center for advice before ordering your plants. Stagger the arborvitae trees in double rows for a thick, full hedge. Plan on 1 1/2 half times the mature width for the cultivar of your choice. For most cultivars, the individual tree spacing is about 6 feet, making a double-spaced hedge about 9 feet deep. 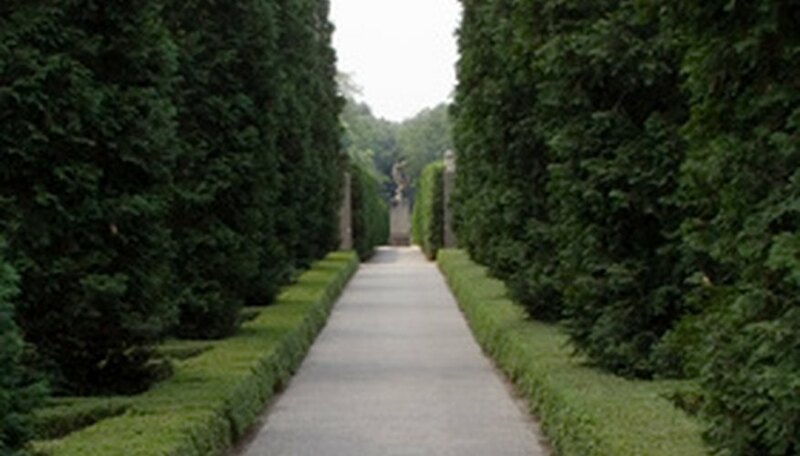 A single line of arborvitae creates a formal look but produces a sparser privacy screen when mature. Pound a stake into each end of your hedgerow and tie a string or rope to guide your first trench. Measure carefully if near your property line. Remove the guideline after the first trench is dug to prevent tripping on it as you go on. Dig a trench down the row instead of individual holes. Till the trench wider on the sides but no deeper than the pot or balled and burlapped plants, leaving the soil below the plant intact. Pile the dug-out soil beside the trench. Set the plants into the trench with the top of the plant at the same level as the ground. Arrange all of your trees in the line before filling in the soil. If the plants are balled and burlapped, remove the top string and fold the burlap down into the hole, leaving the basket intact. The burlap wicks moisture from the roots if it is not completely buried in soil. Fill in the dirt a little at a time, checking the trees for vertical level. Mix in peat, manure or compost along with the native soil as you go. Step back and check your work often. Water each plant thoroughly with a hose, soaking the entire root ball and surrounding soil. Add more soil if settling exposes the roots. Add mulch around the arborvitae trees to hold the soil in place and conserve moisture. Water the trees twice weekly for the first few weeks, then once a week if it has not rained. Arborvitae have shallow roots and need about an inch of water a week. Prune arborvitae lightly if desired with the top narrower than the base. Many upright cultivars have a natural cone shape that do not require pruning. Hedges, while beautiful, are not low-maintenance. Regular removal of weeds and volunteer trees will keep the hedge looking its best. Do not use anti-transpirants on arborvitae. Slow water in the fall to allow the plant to fully harden off for winter. Choose a winter-hardy variety in cold climates for best results. Arborvitae is susceptible to deer browsing. Cheryl Smith has written natural science curriculum since 1986 as a naturalist, landscape designer, and master gardener. Smith currently writes for eHow and GardenGuides. Smith holds an Associate of Arts from Normandale College plus graduate studies in landscape design and environmental education from Minnesota State Colleges.